CCRT is pleased to once again partner with Pet Valu to bring you an Information Day. 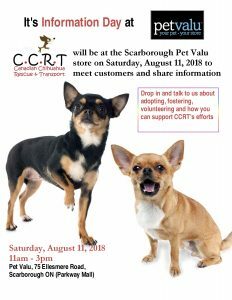 Stop by the Scarborough Pet Valu on August 11, 2018 between 11am and 3pm to meet our volunteers and learn about our group. You might even meet a foster dog or two looking for their forever home! We’d love to see you and your Chihuahua (or Chihuahua wanna be)! WHY: Because we love to talk about all things Chihuahua!